Gremlins Gourds | Henry Field's Seed & Nursery Co.
Large gourds with lumpy, bumpy skin in various solid and speckled vibrant colors. A multitude of shapes including stars, wings,acorns, mushrooms, necks and more! 100 DAYS. Spacing: 4 - 6 seeds per hill, 5 - 8 feet between hills. 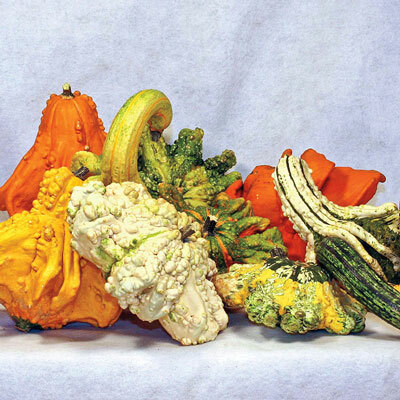 Fruit: 5 - 7 inch gourds with lumpy, bumpy skin in various solid and speckled vibrant colors. A multitude of shapes including stars, wings, acorns, mushrooms, necks and more!